If you're going to make a kegerator, jockey box or beer dispenser for your bar or keg system that's any good, you are going to need a quality beer faucet. They are integral to your dispensing system. A good faucet will not leak and you'll feel like a king when pouring a cold beer from something you've installed yourself. When looking for the best kind of faucet for your set up, you may want to consider the following attributes. Your tap ideally will have a 4-inch shank threading which means it's suitable for all standard tap handles. The faucet and shank are ideally made of chrome-plated brass or stainless steel. That's your basic set up for a faucet. As with most beer brewing equipment, there is an absolute range of faucets on the market from your basic steel versions that retail for cheaper than 15 dollars to the high end of the market where a quality chrome faucet will cost you a sharp 55 dollars. It's up to you as the master of your domain to install whatever kind of faucet you want, but just remember, cheap and cheerful is for dining, not a good beer drinking experience. Cheap equipment can corrode over time, many you'll need to replace it, effectively doubling your cost! We would recommend you go at least mid-range when selecting a beer faucet for your kegerator. If you don't want to muck around deciding on what to buy, then it may interest you to know that the beer faucet that is most often bought via this site is the renowned Perlick 630SS tap. The Perlick is a bit of a premium champ went it comes to faucets - it's a genuine quality product. Featuring a forward seat design to prevent the lever from sticking and quick handle action, it's easy to take apart and clean as well. The Perlick also features a 'spout angle' that helps keep your homebrew from collecting inside. This feature reduces the chance of beer drips. Many industrial players install these faucets on coffee dispensers due to their exceptional performance and low maintenance needs. "Amazing faucet! Never gets stuck or clogged like others. I can keep the keg pressure significantly higher than my old faucet and still get a smooth pour. Highly recommended." "So far I have 2 Perlick 630SS taps and they both work flawlessly. I have not tried any of the generic taps but went straight to these. If these keep working as they are then I will be enjoying these for years to come." "Great taps, and a good price. They seal quite well, and don't leak at all"
If these genuine, real deal testimonials seal the deal, check out the price on Amazon. It's sturdy and made to do the business of tapping a keg. To install one simply pulls out and then down on the lever handle to properly couple the keg. The 4.9-inch length and 4.2-inch width of this beer faucet make it easy to handle and function. 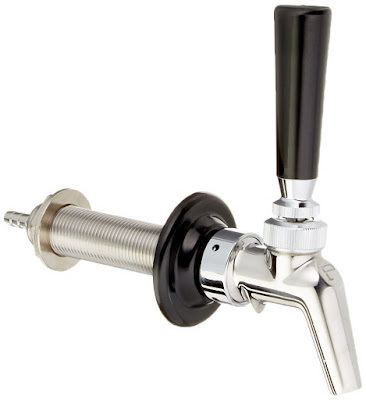 It has a standard 4” shank threading makes this beer faucet quite suitable for all standard tap handles. The black knob is a twist on and can so you can swap it out with your own personal knobs! To add and remove faucets, a specially designed wrench may be of use. These handy tools will help you install your facuet relatively easy. The key thing to remember is to not over tighten the faucet! Can I get methanol poisoning from home brew beer?